Does your business need a mobile app? Before investing a lot of resources into developing a mobile app, be sure that it's the right thing for your company and your audience. 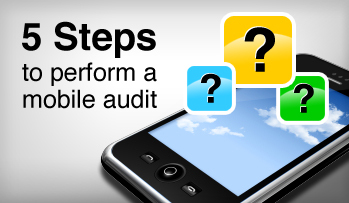 Below are 5 steps to perform a mobile A.U.D.I.T. Is your audience ready for a mobile app? Even the best mobile apps will be rendered useless if your audience and customers aren't tech savvy individuals. The number of people with smartphones increases dramatically every day, but that doesn't mean that all smartphone owners are power users of mobile apps. "While usage continues to increase for native apps as a category, the typical user is working with only a handful of apps," said Christian Gurney, President & CEO of Torsion Mobile. He added "The abandonment rate for installed apps is very significant. So the value proposition for continued app use must be very strong." So, how do you know if your audience consumes your content via their mobile device? You can start by reviewing your website analytics. If you have Google Analytics installed on your website, you can view the number of visitors accessing your website via mobile. This may give you a rough indication of mobile popularity amongst your audience. Combine this data with industry reports on mobile usage for your audience demographics and consider asking a large sampling of your existing customers about their mobile usage. "With 800,000 Apple AppStore and 600,000 Google Play apps, random discovery and installation of a native app is a low percentage proposition. So any native app you produce will require marketing efforts to get to your customers and prospects," said Gurney. 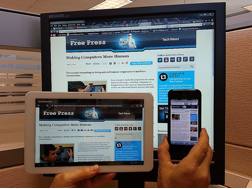 Understand the difference between a mobile app and a mobile-optimized website. Your company may not need a full mobile app. Rather, a website that is optimized for mobile viewing may be all you need. There are great mobile website builders such as Mojaba, a tool created by Gurney's team at Torsion Mobile, that allow companies to quickly create a mobile website. Mojaba can help you create a mobile presence that leverages smartphone functionality, such as geolocation services and click-to-call buttons, while presenting information following best-practices for mobile viewing. At Stream Creative, we use Mojaba and appreciate the ease-of-use and robust functionality that it offers. Our clients appreciate having a tool that allows them to make updates to their mobile website without having to write a line of code. What are the goals of your mobile experience? Is it simply to showcase your product/service or are you creating a custom tool that requires functionality such as using your phone's camera? Outlining the specific goals and functionality of your mobile experience will help determine whether you need a full mobile app or if a mobile-optimized website will do the trick. Frequent use and personalization - will users need to login frequently to see highly personalized information (ie: robust dashboard info)? Complex interactive games - will your game require your phone's processing power? Camera access - will your app need the ability to take and upload photos? No Internet connection needed - will your app need to run natively on the phone, with or without Internet connectivity? If your goals are more marketing and communication driven, then a mobile website is probably the right fit for your company. If your goal is to create a complex data processing tool, then a mobile app might be your best option. The other obvious thing to consider is your budget. Creating a mobile website is much more cost-effective then developing a mobile app. Native apps, obviously depending on features and supported platforms, can be significantly more expensive to produce. And each time the operating system is updated, it may be necessary to update the app (e.g., iPhone 5 and iOS 6 - different screen height). Native app developers are scarcer, which can drive up the cost of development. It's easier to teach a web developer mobile site principles than it is to make them into app developers. What content are you going to present to your audience? Think through what your users will be interested in if they are viewing your website via their mobile device. Be sure to look at your website analytics to see which content is the most popular amongst your audience. Make your action-oriented content very easy to find on your mobile website. You can give users the option to "View your full website" if they so choose. This will allow them to browse your full desktop website in the event that they want to read your blog and learn more about your company. "Native apps and mobile websites are not mutually exclusive. Giving smartphone visitors a mobile website experience today helps you gather information on what those users are trying to accomplish. This data is valuable in narrowing down the feature sets for native app development," said Gurney. Gurney added, "The great thing about the mobile web is that you can do something very quickly and update as you learn more - all the while actually engaging and listening to customers." Having the ability to publish something quickly, in smaller iterations and analyze how people are using your mobile website can save you thousands of dollars in development. Again, why create a robust app if no one is going to use it! Is your company considering developing a mobile app? What problems will your app solve? What tools have you considered? What other steps would you add to this audit? Please share you comments below.